The Public Investment Fund (PIF) of Saudi Arabia today unveiled the six Knowledge Partners who will lead cross-industry taskforces at the second edition of the Future Investment Initiative (FII). The second edition of FII is taking place in Riyadh from October 23 to 25 and will explore how investment can be used to drive growth opportunities, fuel innovation and shape future economies. 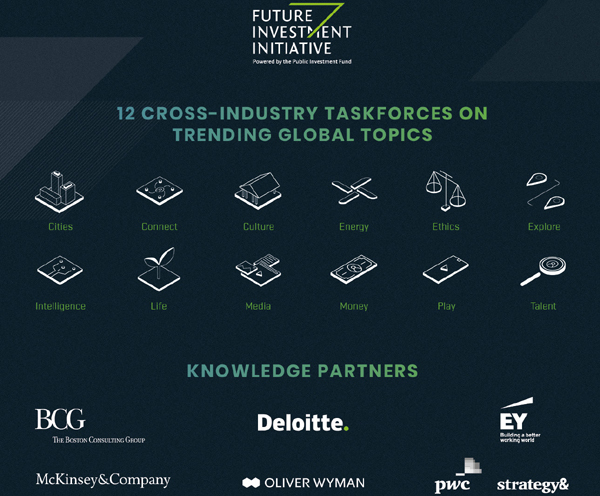 The six knowledge partners are: Deloitte, EY, McKinsey & Company, Oliver Wyman, PwC / Strategy& and The Boston Consulting Group. Each company will bring together senior leaders from business, government and civil society for an in-depth discussion and learning session. Hani Ashkar, territory senior partner for PwC Middle East, said: “PwC / Strategy& Middle East is honored to be Knowledge Partners at the FII, where we will lead expert discussions on transformation in the healthcare industry and in arts and culture. We believe that disruption has become a key dynamic in today’s global economy, with breakthroughs in technology and customer experience redefining business models.These discussions will shed light on trends in these industries and their impact on our region and globally."